That KFC chicken-scented log for your fireplace does the trick, sure . . but something is missing. Wouldn’t it be nice to have the smell of gravy fill the air along with your favorite finger-lickin’ chicken? 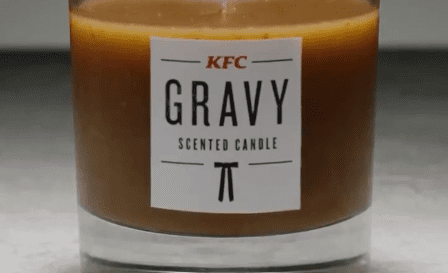 KFC heard you and they’ve responded with a gravy-scented candle. There’s a catch though because, like we’ve heard a thousand times, if it’s too good to be true, it probably is. Here’s the deal. Unfortunately, KFC only made 230 of these candles, and you can’t buy them. You have to be lucky enough to WIN one. Oh and one more thing, you have to be in the U.K.
Hopefully this will be available in the states soon. Until then, enjoy the sweet sounds of deliciousness.